This is not the official City of Burien site for Seahurst Park. If you need to contact them to inquire about rentals, rules or anything else related to the Parks Department, you can do it through their web page or by calling (206) 988-3700. The Wetlands 06/10/2008 and Critical Ordinances and Environmental Impact Statement analysis are now located on the Neighbors of Seahurst Park site, clicking the menu items will redirect you there. Cindy Cripes took these photos on November 6, 2008 from a residential neighborhood on the hill above the south side of Seahurst Park. 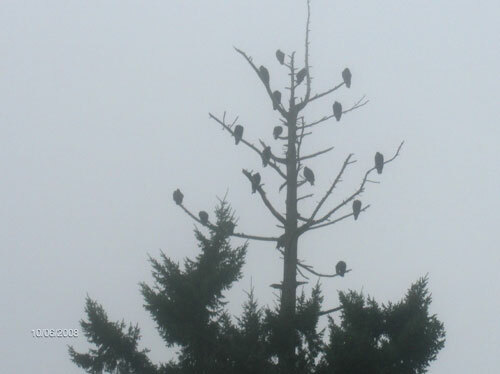 It was a foggy day and for some reason a bunch of juvenile eagles all ended up in one tree. 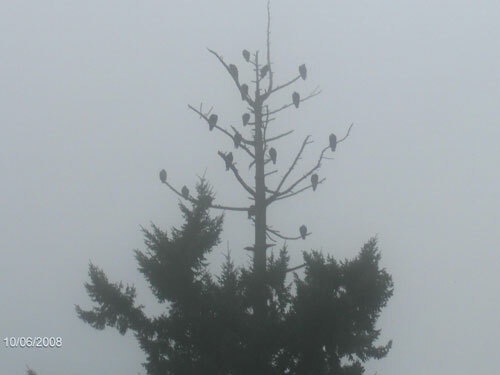 At the peak there were 23 or 24 Eagles in the tree. At the time of the pictures there were 18. Photos used with permission. You can click each thumbnail to get a larger version, each about 20 KB. I've moved out of the area and am not able to keep this site updated the way I'd like, but every now and then something grabs my attention. It turns out that the long awaited restoration project for the beach on the north end of the park is about to start. As a result much of the park will be closed for an extended period. Keep an eye on the B-Town Blog, the Highline Times and the City of Burien Parks Department web sites to get updates. The links below will get you started. I'll add new ones when I find out about them. You should also check out the City's Project Website. UPDATE: All seawall debris has been removed from Seahurst Park B-Town Blog. January 16, 2014. The article includes a link to Burien Parks' Flickr account with lots more photos. PHOTOS: Some scenes of – and an update on – Restoration Work at Seahurst Park B-Town Blog. November 25, 2013. 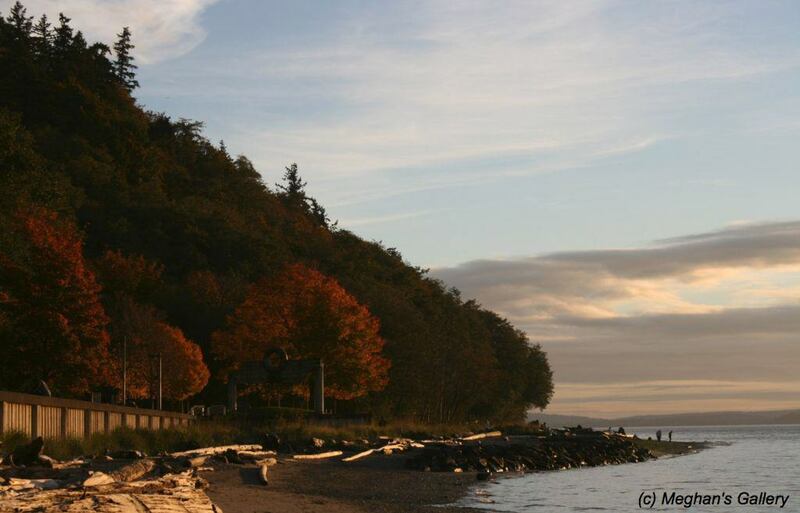 Seahurst Park will close Monday, Oct. 28 to begin restoration project B-Town Blog, October 15, 2013. VIDEO: Ground broken for Seahurst Park Shoreline Restoration Project Monday B-Town Blog, September 16, 2013. The following quote is from this article in the B-Town Blog: Groundbreaking for Seahurst Beach Restoration Project will be Sept. 16, August 19, 2013. The Burien Parks and Recreation Department has announced that a groundbreaking event for the Seahurst Beach Restoration Project has been set for Monday, Sept. 16, at 11 a.m.
State and local elected officials, Congressional staff, state and local agency representatives, as well as representatives of the different project funding partners are expected to attend. The Army Corps of Engineers solicited bids on the project Wednesday, Aug. 7. Bids are due Aug. 27 and the Corps will award a contract by Sept. 5. It anticipates issuing a Notice-to-Proceed on Sept. 15. Seahurst Park, North Shoreline Restoration Project Burien Parks Announcement. Back to nature for beach at Burien's Seahurst Park. Seattle Times, September 14, 2013. PHOTOS: 'Last Low Tide' before Seahurst Park Beach undergoes restoration B-Town Blog, August 20, 2013. Restoration of Seahurst Park north beach begins next month Highline Times, August 8, 2013. Seahurst Park to close Sept. 3 for construction Highline Times, July 7, 2013. The new building for the Environmental Science Center opened in October 2011. A lot of people have worked hard on this project for many years, it's great to see the building finally opening. See the ESC website for updated information. The ESC is continuing it's fund raising efforts for all their work. There are regular work parties in Eagle Landing Park, the Salmon Creek Ravine and Shorewood Park. Work parties in Seahurst Park are as available. To find out the schedule contact the Burien Parks Dept. or check the listings on the Park Volunteer page. The Parks Dept. would be happy to work with you about scheduling special work parties too. Adopt-A-Park work parties are supported by Seahurstpark.org, EagleLandingPark.org, the Shorewood on the Sound Community, the Burien Parks Department and the Environmental Science Center. Do you have any old photos of Seahurst Park or the area before it became a Park? If you do, I'd love to get copies that I can post in the Photo Gallery. Please contact me using the address at the bottom of any page on the site. May 2010 (Updated November 29, 2010): Seawall modification impacts study starting in Seahurst Park. Related to the past and future seawall restoration projects in Seahurst Park, Dr. Megan Dethier of Friday Harbor Labs has been conducting research along the beach in Seahurst Park for the University of Washington. She and her team were doing observations and experiments on the impacts of shoreline armoring. They focused in part on Seahurst because of the past-and-planned Phase I and Phase II removals of sections of the seawall and restoration of the beach - it makes a great 'experiment' to study the long term impacts of these changes. The data collected now was compared to past data and will be compared to data collected in the future so that an objective evaluation of the effects of the changes can be made. If you see mesh cones or other equipment buried on the beach, please do not disturb it. For more information you can view this PDF Flyer (348kb). The report "Shoreline Changes over 40 Years in the Seahurst Region, Central Puget Sound, October 2010" can be downloaded from our site and from the DNR website. Additional information related to Near Shore Habitat is also on DNR's Near Shore Habitat pages. On May 24, 2010 Burien's Seahurst Park Beach was recognized by the American Shore and Beach Preservation Association (ASBPA) as a winner of its 2010 Best Restored Beach Award. The award is for the section of beach south of the parking lot that was restored in 2004. You can read about it in the B-Town Blog and the Highline Times The award was from the American Shore and Beach Preservation Association and you can read the full press notice on their site. In November 2009 the Burien Parks Dept received a Rock Award from the King Conservation District. This award is given to a local municipality or public entity that demonstrates excellence in implementing conservation programs and/or practices in their jurisdiction. The Seahurst Park seawall removal and revegetation project has been an extensive project to restore habitat for young salmon along the shores of Puget Sound. The Burien Parks department showed leadership in pre-project planning and post-project monitoring and maintenance. In addition, they have tremendous support and engagement from community volunteers. You can read the announcement in the KCD Winter 2009 newsletter, as well as information about winners in other categories, upcoming classes and tours, and more..
Help protect our Park. If you see suspicious or inappropriate activities please notify the Parks Department or call the police if necessary. The Park belongs to all of us, help protect it so that we can all enjoy it. Vandalism and theft are problems almost everywhere these days, lets try to keep it under control in the Park. Be aware of what's going on around you. Moonlight Beach Walks in Seahurst Park. Twice a year, normally in December and January, Beach Naturalists from the Environmental Science Center, People for Puget Sound, and the Seattle Aquarium. will on hand to give talks, lead walks and answer questions. You'll need to bundle up against the weather and bring a flashlight with good batteries, wading boots, a warm hat and dry gloves. See the Environmental Science Center's website for more information. Check the tide table to find the best times to go to the beach. A lot of creatures live on the beach, and they are often exposed at low tide. Please remember that you're in their house, and many of them are very fragile. Watch where you step, and don't remove anything [except garbage] from the beach, it's all part of the habitat. Additional information about the Beach Naturalist program is available from the Seattle Aquarium. 1. Be extra careful where you step so you don't step on animals or their homes. 2. When you want to look more closely at a creature, bend over and look rather than picking it up. Leave animals where you find them. Don't move them to a new home! 3. Touch plants and animals gently with one wet finger. Animals living on the beach and in the water are cold and wet, your fingers are warm and dry. Simply touching a plant or animal may be enough to injure or kill it. 4. If you want to look under a rock, be gentle. Turning over a rock can be like someone turning on a bright light in your bedroom in the middle of the night. Lift it slowly and gently. When you're done the rock needs to be gently returned to its original position. Leave all shells and animals on the beach rather than taking them home. Shells and rocks need to be left on the beach because they provide a home for the next generation, an animal's children, to live on. Seahurst Park is located on the shore of Puget Sound in Burien, Washington which is just south of Seattle. The shoreline area in the Park is designated as a Marine Reserve and is undergoing a habitat restoration project. The Park has walking trails, a paved path above the beach, a great deal of wildlife, magnificent views across the Sound towards the Olympic Mountains, restrooms, picnic shelters (available for rent), parking areas and much more. It is a wonderful educational and recreational resource. In fact many local and not so local [Ellensburg sends students over each year] schools bring bus loads of students down to the beach at low tide to give educational presentations. Beach Naturalists and Scientists from the Environmental Science Center are available to help work with students. Please contact them for more information if you're interested. This Google Map will let you see what the park looks like, and has many of the features marked on it. Seahurst Park is surprisingly untouched by development considering that is so near to Seattle and surrounded by urban areas. For many years it was used by the Duwamish Indians as a gathering place, for harvesting berries and other plants, for fishing and more. When settlers arrived in the late 1800s it was homesteaded, but apparently primarily so that the lumber could be harvested. In the 100+ years since the logging was completed much of the Park has returned to it's natural state. There are some huge old stumps with springboard notches scattered around the Park, but many of the trees that have grown up since then are over 100 feet tall. Once the logging was done the area was used for recreation by local settlers, and because of all the springs, as a water source. Many springs are still found in the Park, and running water can be found in many areas all year long. Subsurface ground water from the area of the park also surfaces along the beach, keeping the sand wet at low tide so that plants and animals can survive there. For many years people from Seattle would travel to what is now Seahurst Park for recreation, even when that required a long boat trip or horseback ride. There are stories that it was also used a place to land liquor shipments during prohibition. Seahurst Park was first officially opened in 1975 and was operated by King County. Burien took over ownership of the Park starting in 1993. The Park is currently approximately 178 acres after the City of Burien was able to acquire additional property from the Brown family in September of 2007. There are a few more parcels that the City hopes to add to the Park. There is over a mile of shoreline in Seahurst Park, which has been protected by a seawall for many years. As part of a Shoreline Habitat Rehabilitation program the seawall is being removed and a natural style of beach is replacing it. One of the primary purposes of the work is to enhance habitat for migrating salmon by providing more shelter and food. The southern third of the project is nearly complete, the schedule for the next phase depends on funding. See our FAQ page for a lot of information about using the park and about what is going on there. The northeast corner of Seahurst Park contains what appears to be a large, undocumented, and undisturbed wetland which filters and regulates the water coming off the higher ground east of the park. The wetlands are the sole source of water for North Creek, which feeds into the Sound and also supplies water to the Salmon hatchery at the Marine Technology Center run by the Highline School District. These wetlands (and therefore a large area of the park) could be in danger from a proposed development on the eastern boundary of the Park. Neighbors of Seahurst Park have a Wetlands page with more information about the wetlands and the danger that they face. This unique wetland is at risk, and if it's damaged or destroyed it will not recover in our lifetimes, perhaps never, depending on what happens to it. There is also a comparison of the Burien Municipal Code (that should apply to this project) and the developers plans, which are based on outdated, inadequate regulations from early 1990. The potential for damage is immense. This Google Map shows some highlights of the wetlands. This map is different than the one linked to above.